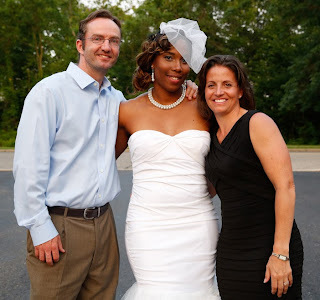 After graduating from the University of Hartford in 2010 and working as the Director of Basketball Operations in 2011 at Hartford, I had the chance to play basketball professionally in Switzerland and Australia. Now, I am living in South Jersey with my husband, Andre Thomas and I love it! It is a change from the city life, but everyone who knows me knows I love my southern roots. I am currently pursuing my cosmetology license at Empire Beauty School and will complete my license by November! I have a lot of passion for cosmetology and love that there are so many different ventures you can go into such as hairstyling, being an esthetician or nail artist. I’m very excited about having the chance to pursue this passion and looking forward to seeing what my future holds! I got married on June 15th 2013 to my husband Andre in Burlington City, NJ at Tabernacle Baptist Church! It was such a beautiful and sunny day that the Lord blessed us with. We had our family and friends, including many former Hartford teammates, with us for the celebration and we couldn’t have asked for a better day! From the design of my dress, our aisle runner, to the church décor and my brooch bouquet and even the groom and best man pants, our entire wedding was so unique and special and I enjoyed planning it. I was very pleased with how it turned out and it was so much fun. My wedding day is one of my proudest moments. I’ve had a lot of time to reflect on my experiences as a Hartford Hawk and I have to say my favorite memories are the bonds with my Hartford family (coaches, teammates, fan’s and the staff I worked with at Hartford). The most profound part of the bond is that it still exists today! I’ll also never forget after I tore my ACL at the beginning of my sophomore year when Coach Rizzotti sat me down at the end of the season and explained to me that a NCAA rule change would now grant me a red-shirt year (originally we didn’t think it would be a possibility). That moment was so important because I could see the joy in Coach Rizzotti’s eyes and we both started to cry. I felt as if she was treating me as one of her own children. I was so filled with appreciation and determination to recover from my injury and make our program proud.